We all know and love zucchini season. It is the season that comes between summer and fall. It's the season when you'll go out of your front door in the morning and find a bag of zucchini there that the zucchini elves left for you during the night. That's exactly what happened to me today, so I knew zucchini season had once again arrived in my neighborhood. Has zucchini season arrived in your neighborhood? If not yet, it will arrive soon and I want you to be prepared. I've been grilling up a storm this month and I love it! We have and outdoor gas grill that we use for a good portion of the year, but summertime is prime time for the grill. The grill works beautifully for preparing grilled vegetables and zucchini is a wonderful addition to a grilled vegetable medley. I don't know about you, but on a hot summer evening, I want no part of a complicated meal to prepare for dinner. Fast and easy is the name of the game for me. That's when I give thanks for those zucchini elves and the bounty of zucchini they bring to my doorstep. 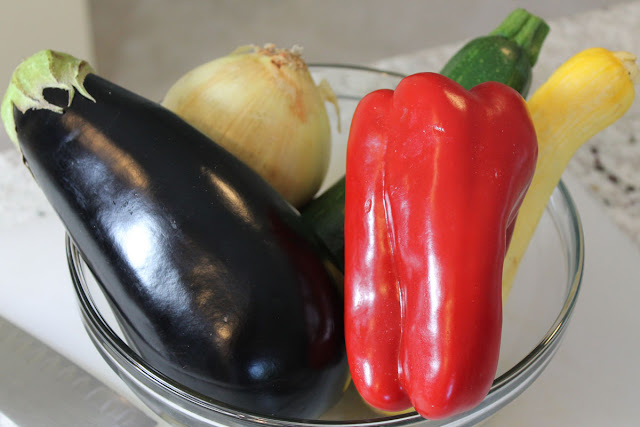 To make my grilled vegetable medley, I cut a zucchini, a red pepper, an eggplant, and an onion into chunks and marinate them together in a bowl, tossed with a cup of my favorite oil-based, Italian salad dressing for about an hour. The key to making this grilled vegetable medley is this grill basket. I have owned and loved this one for several years. I don't remember where I got it or how much it cost, but I'm telling you, this grill basket owes me nothing. I love when a kitchen pan or tool is a workhorse and this one certainly is. I'm telling you this because if you love grilling and don't own one of these grill baskets you need to get one. Now. Today. Those zucchini elves will be at your doorstep before you know it. I did some online shopping for you. I found a couple of grill baskets that look perfect for zucchini season. 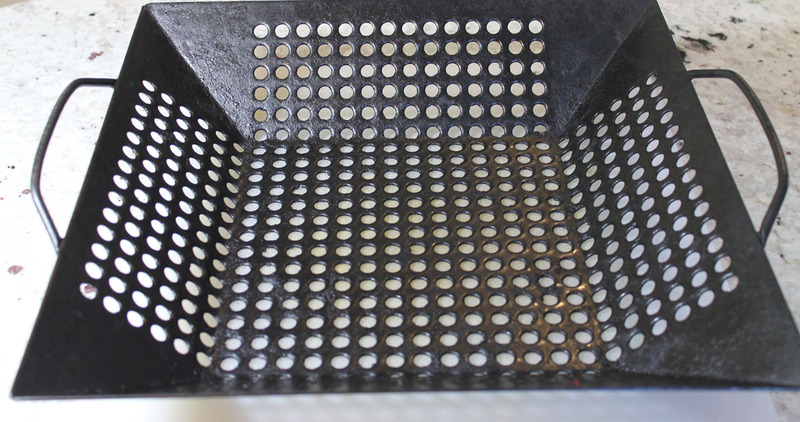 I love this grill basket because it is all stainless steel making it easy to clean. This porcelain covered steel grill pan looks good, too, and more closely resembles mine. Now let's get back to actually grilling those vegetables. Heat your grill until it is smoking hot. Spray some cooking spray on your grill basket (away from the grill) and place the basket on the grill grate. My grill has three heat sections and I like to turn off the center section. I place the grill basket over the section where the heat is turned off. 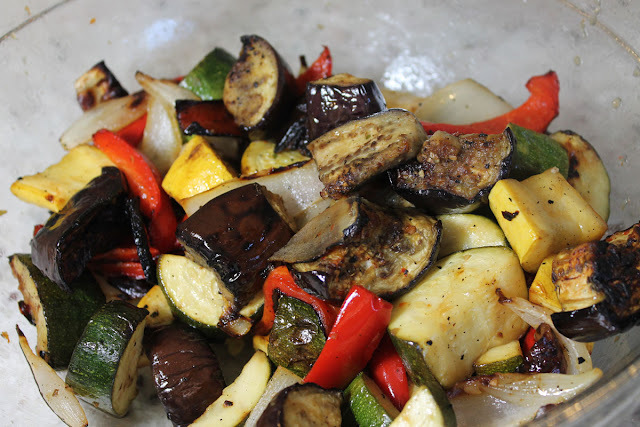 Spoon the vegetables into the grill basket. Close the grill cover and walk away. This would be a good time for you to sip a glass of wine. Stir the vegetables every five minutes, until they are charred on the edges and tender. It usually takes about twenty minutes for a full grill basket of vegetables to cook on my grill. Spoon the vegetables back into the bowl in which they were marinated. If you still have a little of the dressing in the bowl, toss the vegetables around to distribute the dressing. Cover the bowl and set it aside until you are ready to serve the vegetables. This grilled vegetable medley will be delicious hot, warm, or cold. Leftovers make a yummy filling for omelets. They are also perfect with some grilled chicken in a wrap for lunch. Rejoice when zucchini season arrives in your neighborhood. That means you'll have lots of delicious grilled vegetables for your dinner table. 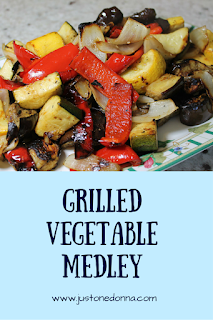 A grilled vegetable medley is easy to make when you have one of the essential grill baskets like the one I have owned and loved for many years. You'll be looking forward to a visit from your local zucchini elf. Long Handled Silicon Basting Brush at a GREAT price! 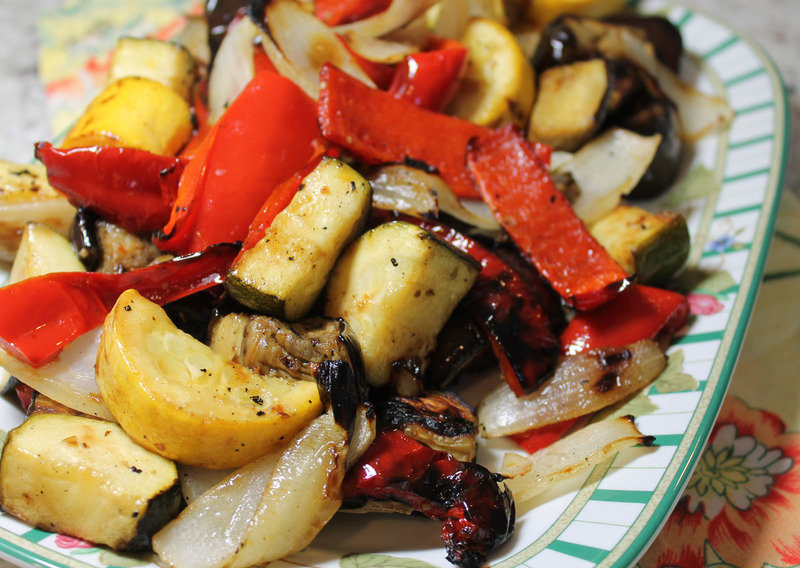 I love grilling veggies in the summer, too. We belong to a local CSA, and I find it to be one of the best ways to enjoy our bounty. It's so open to customizing, too. Sometimes I sprinkle some chopped herbs or shredded cheese over the top. I rely on my backyard vegetable garden this time of year, Susan, but a CSA is a really great alternative to growing your own vegetables. Herbs and shredded cheese are yummy additions.